The best unique homemade birthday gifts are homemade food gifts. In a world of rush-rush and fast food . . . take the time to be different. Give something you've made ~ it's such a happy surprise! Do you love to cook? Well, not everyone does. 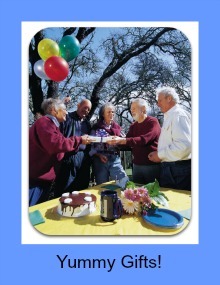 A perfect opportunity for you to give unique homemade birthday gifts. The best homemade food gift ideas will come from your favorite recipes. Do you have a special casserole that your family loves? How about delectable homemade spaghetti sauce? I make really great BBQ sauce that's a real hit. Share your favorite sauce and gift it as a gift. Add a personalized label. Are your parents getting older? If so, I bet you often hear - "I don't like cooking for just the two of us". Or, "I don't like cooking for just one". That's where you come to the rescue with unique homemade birthday gifts for mom and homemade birthday gifts for dad. Here are some recipes and ideas. Purchase some smaller glass containers that freeze nicely. Then create a menu with several different main dishes. Cook items that freeze well like lasagna - a great Italian food gift because who doesn't like pasta? It's one of my favorite unique homemade birthday gifts. Make sure that you label each container clearly with the date and type of food. You can use the labels below or something you make yourself. 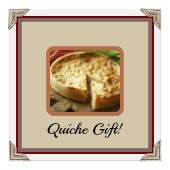 Quiche is another easy homemade birthday gift. It's simple to make and freezes well. You can vary the size of the individual slices depending upon their appetite. Homemade food gifts are perfect for the single person. Make sure you know how much freezer space they have before you start cooking though! You can either make individual dinners like I mentioned above, or bring an entire meal to enjoy the same day. One of the best homemade food gift ideas is an entire spaghetti dinner . . . yummy! ~ Homemade spaghetti sauce. I've been making mine with organic bison rather than hamburger and the taste is incredible. Plus, it's much better for you. This recipe was passed down from a member of my family - Louise Piano. An incredible Italian cook! 1 loaf of soft french bread. Cut in half lengthwise. Spread the above mix on each side of the bread. Cook under the broiler but not too close to the heat element. Watch the bread closely so it doesn't burn! Once it's light brown on top, take it out of the oven and let it set for about 4 minutes. Then cut into smaller 3 inch pieces. You can create a gift basket around your gift. Get a large basket, fill it with sauce, pasta, bread, garlic butter spread (recipe above), some pretty colored napkins, and maybe a few balloons. Add some Italian appetizers and include some beautiful appetizer plates. This is a favorite family recipe passed down from my mom. And, one of my yummiest easy homemade birthday gifts. Mix all together at medium speed for 5 minutes. Pour into a greased angel food cake pan. Let cool a few minutes then turn cake over onto a large plate. This cake is so easy to make and so moist! It will be a hit as one of the yummiest unique homemade birthday gifts.